Wilson’s on the Miramichi River is so impressed with the new Orvis Helios rods that we are teaming up with the Orvis company to bring you what we firmly believe to be the “best damn rod on the market today” ( Karl Wilson – fifth generation Miramichi River guide ). Wilson’s guides are the real pros and after putting numerous Helios rods through the paces fly-fishing for Atlantic Salmon on the Miramichi River in 2008 , they are convinced that every angler should have one of these fantastic rods in their kit . Check out the Orvis link for details on how you can own one of these beauties FOR FREE. Atlantic Salmon fly-fishing conditions at Wilson’s on the Miramich River July 5th . The water is still high and dropping slowly . The aquefer ( underground river ) that stretches far out under the islands allong the river as well as the inland swamps and brooks are fully soaked with water now, which will help keep the river up over the coming summer months . According to world renowned hydrologists Robert Newbury ,who conducted university studies here a few years ago on the river , says that there is almost as much water under these islands during normal summer height as what there is in the river , this is crucial in maintaining a healthy watershed . This is why it is so important not to strip these islands of the precious top soil that protects the aquefer from evaporation . It took thousands of years for the top soil to build up and it takes only a few hours with a tractor and loader to destroy . Luckily for the Miramichi , and other NB rivers land owners are regulated by very strict laws that protect this riparian area from destruction . Air temps at 6:30 Am are around 10c. so water temps are ideal . During the afternoon this last couple days air temps warmed up but with the above average height and cool nights the water is good . We started seeing a lot of fish again yesterday , most of which are grilse so this is obviously the July run on its way in . With the high water we are still fishing only a few pools but these pools fish best in high water anyway . Sometimes big water requires big equipment in order to operate efficiently. We are fortunate to have two of these beautiful cedar strip canoes for getting around in all river conditions . These vessels are designed and engineered to work perfectly on this area of the Miramichi . They are unique by the fact that they are 28 feet long with a square stern and pushed by a 25 hp jet outboard , they will skim over just 8 inches of water with two anglers and guide aboard so we can navigate the river all season . The bottom of the boat is finished with a kevlar mat and heavy hardwood keel , inside is smooth clear epoxy over 1 inch wide cedar strips . Each boat is also set up with electric start on remote controls and a stick steering system that places the guide app 8 feet from the stern , this puts all the weight in the middle of the boat . Having these boats on site provide anglers much more convenient access to our five miles of river therefore increasing your chances of hooking the big one . Just when the river was getting down to the perfect level we get hammered with rain and really high water . It dumped on us big time Saturday night , most of Sunday and then again this morning . The water was still coming up as of 6:am this morning so fishing will be tough for the next few days . On a positive note this is good for the river and good for the fish and with this big run of fish on the move there will still be fish taken in some areas . We will focus our attention on island sections that have wide slopeing beaches that will be covered in one to three feet of water , this will be the travelling lane for the salmon and if you get a fly over one it will still take . So not all is lost we just have to change our tactics and be content with three or four pools instead of twelve to sixteen . Our spey casting camp is going very well this week . We are getting into some decent fishing and as you can tell by this photo some folks are enjoying a shot of Scotch as well . Note the fly box , it is obvious this guy did not want us to see what he is using for fly’s , he shows mostly fall patterns here , so some things never change . We are most encouraged by this cool wet weather and the fact that we are seeing plenty of fish moving through . Nancy W caught her first ever Atlantic Salmon yesterday on her new Orvis Zero Gravity 7wt rod , needless to say she was the first body at the breakfast table this morning , with her new rod still in hand . June 23rd – 28th is Spey Casting week at Wilson’s . Doug Hintzman and Pete Humphrey are two of the best spey casting instructors on the water today and they are bringing their expertise and talent from Michigan to the Miramichi to help our guest’s, as well as our guides improve their abilities at this age old approach to fly fishing . It has always been our goal at Wilson’s to not only take you fishing but to also teach you all the techniques to help you catch more fish . We still have a few slots open for next week and big discounts to boot . 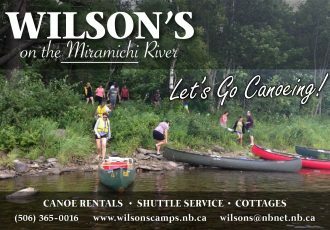 If there are any NB residents who would like to come in for just the instruction portion ( less meals and lodging ) we can arrange that as well . Doug and Pete will have all the necessary gear with them so you don’t have to worry about a new rod , yet . The water and weather is perfect to move fish up the river this week , setting the stage for some great action during our spey casting week . Atlantic salmon fly-fishing conditions and report for the Miramichi River at McNamee on June 5th . We had another small raise of water early this week so the river is in superb condition for mirgrating salmon . We have had several reports from further down river of a few Rocky Brook Run salmon being caught . C. Gilks landed a beautiful 25lb. salmon just yesterday , what a beauty . These fish are tough to catch but if you put your time in on the water the reward will be well worth the effort . I have been on the water each night this week for an hour or so but no luck yet . The big sea-run brook trout have been on the lower Cains for a few days now so with this good water I am certain the entire Cains system will be producing some real trophies over the next several weeks . This is a picture of Geoff Giffin’s huge sea-run brook trout taken last year on the Cains , Geoff is hitting the Cains again soon for a try at another big one, good luck Geoff hope you succeed .